Making a cross-country road trip memorable, the author reserved stays in a school bus (where the family slept) in Thorton, N.H.
Over the years, I’ve approached the classic American road trip in different ways with different people, camping with friends or staying in youth hostels when I was younger, opting for motels or hotels or as I got older. For my 15-year-old daughter’s inaugural road trip this summer, I decided on something a little more offbeat. Here’s why: We had less than three weeks to get to the Grand Canyon, our ultimate goal, and back to Boston, so a leisurely pace was out of the question. My husband and I knew we had to drive a minimum of six or seven hours a day, every day. When normally we’d say, “Let’s see how far we feel like going,” then stop, we had to have a plan. Camping takes a lot of time and hotels begin to look alike after awhile. In order to both make the end of the day fun, and also save money, I booked us at Airbnb stops along the way. There’s been a lot of attention paid lately to this somewhat quirky business, where people rent their houses, apartments, rooms, cabins — even castles or campers — for usually reasonable prices. Browsing the website just for spots around Boston, accommodations range from sleeping on a pullout couch in Jamaica Plain for $65 to having an entire luxury yacht, docked in the North End, to yourself for $500 a night. When you start exploring offerings across the United States, you can find even more unusual choices. To make a game out of our drives, I booked our spots without telling my family where we were staying. I’d offer some clues so they could guess, but Rob and Sadie were most surprised, and delighted, by the following places. Our first official night on the road took us to Thorton, N.H., located close to the White Mountains and Woodstock. A corn crib (where her daughter spent the night) in Ithaca, N.Y.
As we pulled into the driveway and parked behind a yellow school bus adorned with action figures and pink flamingos, I had a moment’s doubt about whether the three of us would fit inside comfortably, but it was surprisingly roomy, with a tiny stove, sink, bed, and even a hammock. 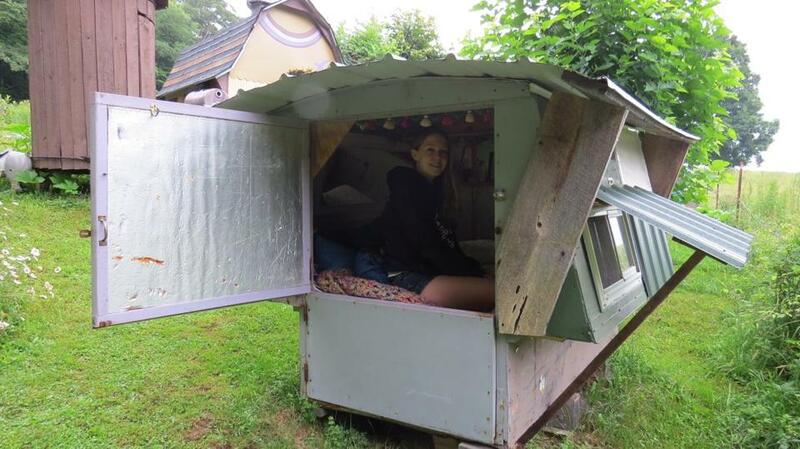 My daughter was not thrilled with the outhouse, located in a small tent nearby in the woods, but show me a teenage girl who would be. 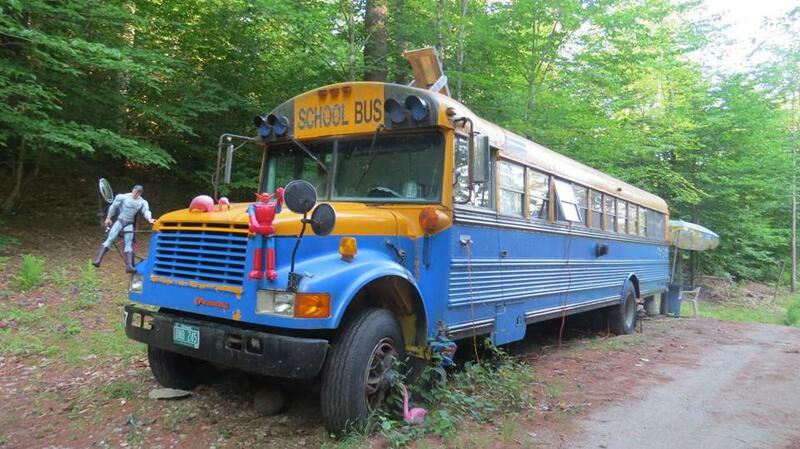 The host had lived in the off-the-grid bus for years before building a house just down the driveway. It was a whimsical way to kick off the trip, but it was just the tip of the iceberg compared with our next stop. The so-called “Tiny Village of Karenville,” named by its creator Karen Thurnheer, is not too far from Ithaca, N.Y., but feels like it’s in another realm, somewhere fairies or hobbits might live. Composed of several small and completely adorable structures, all built by Thurnheer, staying there feels a little bit as if you’ve fallen down a rabbit hole. From the “hotel,” the largest accommodation, which sports a double bed, stove, and sink, where Rob and I slept, to the “tiny room,” actually a converted corn crib, where Sadie slept, to the composting outhouse, which looks like a grain silo, we were utterly charmed. Sadie didn’t even mind the outhouse here or the lack of electricity. A store-cafe, with complimentary food stuffs, greenhouse, dance hall, church, and library complete the little village, which sits below Thurnheer’s off-the-grid house and within sight of Danby State Forest. We easily could have enjoyed several days at this magical place, chatting with Thurheer and enjoying the peace and quiet. 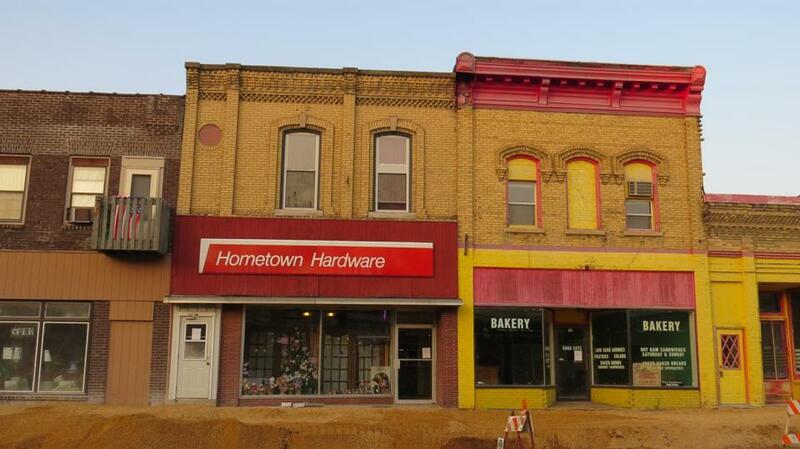 Albany, Wis., was yet another big surprise for my family, who almost flat-out didn’t believe me when we pulled up to what looks like a hardware store and I announced, “This is it.” With just over 1,000 residents, Albany’s main street is a mere block long. In the middle of the block sits “Hometown Hardware,” an enormous converted space that indeed was once the town’s hardware store. Now, it’s a comfortable 1,500-square-foot, three-bedroom apartment that serves as a base for many outdoor adventurers. A theme that came up frequently with the Airbnb places I discovered was a dedication to repurposing places and materials. “Hometown Hardware” was no different. Among other green practices, owner-host Mark Berlinski converted a 1930s Ben Hur freezer to an island stove and used mostly recycled doors, windows, lights, and bath fixtures in the apartment. He also supplies five bicycles; there’s a network with more than 200 miles of bike trails just a few blocks away. A hardware store in Albany, Wis., all of them transformed by their owners for travelers searching accommodations on Airbnb. In Omaha, even I was doubtful of both the directions we were following and what we’d find when we got to the “Chic Tiny House” I had booked. After turning down a side street next to an enormous shopping mall, we found ourselves in what looked like a typical suburban neighborhood. I called the host to see if we were in the right place. Jamison Hiner directed us to his side yard, where we saw his beehives, then opened the tall fence to his backyard, where once again, we were floored at the cleverness we discovered in such an unexpected place. Besides the tiny house that Hiner built entirely by himself, which is tucked behind his ranch-style home, the yard boasts a chicken coop, small garden, fire pit, and fountain. From the street, no one could possibly imagine what his backyard looks like. As for our accommodations, we were duly impressed; from the composting (and completely odorless) toilet and working shower to the clever convertible couch to the small loft with a queen bed, every detail was well-planned and thought out. After acquainting us with the house, Hiner started cooking dinner on his outdoor grill while we settled in. It felt a little surreal, but we were entirely comfortable. The last of the unusual accommodations we had on the trip is so complicated to get directions to that the hosts don’t even try any more. Brekke and Ryan Munks, who rent out an apartment in their commercial machine shop in Saratoga, Wyo., told me to text them when I got to the nearby town, then directed us to a mile marker on a lonely road. Brekke was waiting in her car and told us to follow her. Rob and Sadie were guessing as we drove behind her through a mostly empty landscape. A tepee? A log cabin? A camper? They didn’t expect to pull up to what looked like a giant aluminum-sided warehouse. Most of the building is the machine shop, but you’d never know it once inside the immaculate and well-appointed 700-square-foot apartment, with full kitchen, bath, washer and dryer, not to mention electricity and satellite television. Brekke spent some time telling us about the area and had graciously left us fresh fruit as a snack. On our 17-day trip, we visited some of of the country’s great sights, such as Mount Rushmore, Arches National Park, and of course, the Grand Canyon, but talking with people who share their spaces with strangers was a highlight for all of us. It was weird and wonderful, took us to places we’d probably never go otherwise, introduced us to people we’d probably never meet, and by my lights, was exactly what should happen on a road trip. Kim Foley MacKinnon can be reached at kim@kfmwriter.com.